This plugin modifies bloodlust to be based on your PC's willpower before transforming. This mod also limits werewolf transformations to only full moon nights. In addition there is an alternate version of the mod that allows the player to tranform at will. The change at will version is excatly the same as the moon only version except it also allows you to change at will by depressing your sneak key for a very short period of time-only if you are a werewolf and are above level 20. There is NO warning messagebox so be careful! If you transform via this method you won’t regain health by killing as you would when using Hircine’s ring or forced transformations but you will automatically receive a regeneration spell. ALSO use caution when changing back you will be VERY tired. Your character may be stuck on the ground naked for several seconds so you’ll need to find a very SAFE place to change back. Also note that the use of the sneak key will conflict with other mods that assign a special use to the sneak key such as the combat moves mod. This mod is probably best used with a mod that adds more NPCs (such as Morrowind comes alive) to the game since your requirement to kill is, in most cases, much higher. Also you will receive a burden based on the number of NPCs you killed the night before-this represents the flesh you eat in wolf form. The more NPCs you kill, the higher this will be. This burden will disappear when you transform again or at midnight of the next day. You must kill at least one NPC to avoid suffering weakness from bloodlust once you change back to your non-were form. You will gain 100 health points for each NPC you kill. You will not receive the werewolf regeneration spell under any circumstances. You will need to kill an NPC every hour to avoid suffering health loss from bloodlust. You must kill at least one NPC to avoid suffering weakness from bloodlust once you change back to your non-were form. You will gain 200 health points for each NPC you kill. You will not receive the werewolf regeneration spell under any circumstances. You will need to kill an NPC every 2 hours to avoid suffering health loss from bloodlust. If you kill 2 NPCs you will receive the werewolf regeneration spell. You will still suffer from bloodlust but the regeneration spell can heal the damage fairly quickly. The bloodlust will stop for 3 hours after you kill an NPC. You will still need to kill at least one NPC to avoid suffering weakness from bloodlust once you change back to your non-were form. You will still gain 200 health points for each NPC you kill. If you kill one NPC you will receive the werewolf regeneration spell and bloodlust will stop. You will still need to kill at least one NPC to avoid suffering weakness from bloodlust once you change back to your non-were form. You will still gain 100 health points for each NPC you kill. This is basically the same thing as a standard bloodmoon werewolf except for the 300 point health gain. No bloodlust at all. You automatically receive the werewolf regeneration spell. You will still gain 300 health points for each NPC you kill. Note that you may receive multiple messages. I don't think there's anything I can do about that but it's the LAST one that is correct. 1. It modifies certain non-essential NPCs in Morrowind to be werewolves they aren't everywhere but not too far off the beaten path. There are a grand total of 17 new werewolf NPCs. 2. It allows you to become a werewolf before starting the main quest without forcing you to cure your lycanthropy. I tweaked some dialogue of some of the characters to accomplish this. 3. 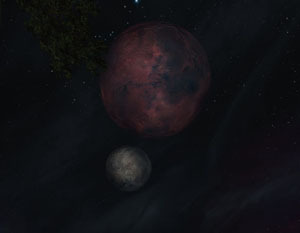 IF you use the moon only version, you will only have to transform into a werewolf at the full moon EXCEPT during the middle portion of the bloodmoon main quest This is to keep the bloodmoon main quest from dragging out for 5 months or so. Once you beat a certain portion of the main quest you'll start transforming every night until you beat it. This happens when you complete a certain quest. Unfortunately if you complete it at night you'll instantaneously transform into a werewolf. Fortunately the quest is in the middle of nowhere so you shouldn't be seen by anyone . ..
4. Being a werewolf now gives you a stat bonus to your non-were form. Beware, you will lose it if you choose to cure your lycanthropy. 5. All of the bloodmoon werewolf quests give you a better reward. The very last quest will give you an enhancement to your werewolf form. 6. One werewolf NPC will recognize you as a werewolf and say a few words about what it's like to be a werewolf. No quests are involved as of yet. The best way to play this mod is to either start a new game or at least use with a low-level character that has not started the bloodmoon quest and hasn’t become a werewolf yet. You can use it with a character that is already a werewolf and has beaten Bloodmoon however, your only benefit will be being forced to transform only at the full moon and the "enhanced" bloodlust. Finding the new werewolf NPCs is pretty easy. Since they don't usually carry weapons they are pretty easy to spot. If an NPC comes up to you and tries to fight with you hand to hand, there's a decent chance it's a werewolf. Use caution though as they all have a hand to hand skill at 100. This mod also INCLUDES a Daggerfall style Hircine’s ring (so you don’t need/shouldn’t use it with the hircine’s ring fix mod). This means the ring will only work for those that are infected werewolves. The ring will also block forced transformations when equipped but not used (select No from the menu) When you use the ring you will not be required to kill NPCs but if you do you’ll regain 300 health points per kill. As with forced changes, you’ll receive a burden based on the number of NPCs you killed while in werewolf form. It will disappear if you transform again or at midnight of the next day. This mod also allows you to become a werewolf outside of the bloodmoon main quest and NOT be forced to cure yourself. "You feel that the influence of the moons is almost null"
"You feel that the influence of the moons on you is weak"
"You feel the influence of the moons"
"You clearly feel the strong influence of the moons"
"You are totally under the influence of the moons"
There is no distinction between waxing and waning phases You’ll have to figure that out for yourself by reading the messages. Another way to tell if the moon phase is to either watch the sky or type into the console: Getmasserphase or Getsecundaphase. The two moons ALWAYS have the same phase so it doesn't matter which one you type. Unfortunately you can't tell just by the number whether the moon phase is waxing (going toward full) or waning (going away from full). The only way you can tell is by watching the sky and/or seeing the number increase or decrease by using the console.